And another battle behind me. My small (but still growing) Skaven army lost with Bretonnians this time;). What a bugger – the battle was tight and my rolls were so disappointing, so I could probably assume if they were a little bit better I would won this. Well, it happens. First scenario we played was Blood and Glory, which I lost very quickly – my general died in first turn killed by some ugly Bretonnian spell and my Clanrats panicked and fled of the table due to almost entire annihilation by hit of Trebuchet’s stone. And the braking point reached. I can diplomatic say on my defence that I didn’t want to play this scenario – I do not like it at all. I played it few times and the battle ended too soon. First or second turn. Playing on small points, it’s very easy to achieve victory conditions. It’s stupid and annoying. Of course I had extremely bad luck and I should arrange it all better – but like I said this scenario is not my favourite and maybe subconsciously I wanted the game to ended quickly so we could play normal game (I know, I know – excuses, excuses, excuses – I lost and should accept that;). Anyway I had awesome game(s). And I planned it will be the end of the story of Grey Seer Quicksqueek and his struggle for glory. We played 1400 points game of 8th edition of WHFB. 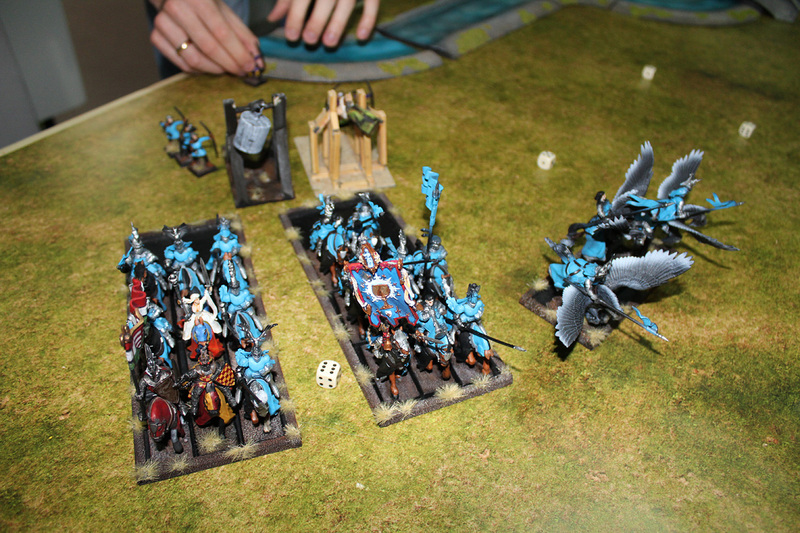 Not many players of Age of Sigmar around – so we continue to play what we know and like the best. Good ol’ Warhammer Fantasy. And now – to the battle report. Lord Quicksqueek was defeated and ashamed. 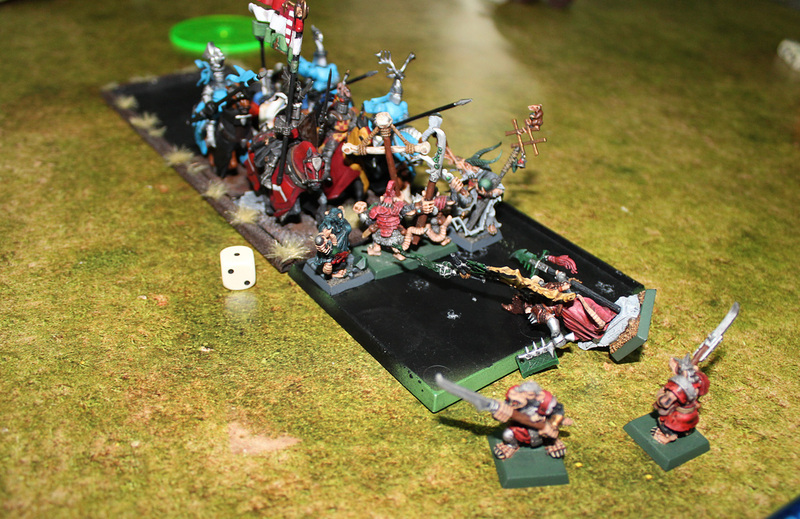 Puny Goblins smashed his army – and he had no means to rebuild it in full strength. Just few poorly trained and equipped Skaven regiments. Even rehired Doomwheels seemed to look and function worse – the machinery looked fairly used. They had their best days long, long time ago. There was literally no possibility to gain any valuable loot in near future. The city of Embrun was sacked by Goblin Warband – Lord Quicksqueek needed to forget about that – it happened so sudden. Man-thing gold was so close to get, so easy to obtain, but it was gone now. The time was to regroup and plan next moves. Unfortunately Bretonnian Duke, Adam de Embrun was back from the overseas war to defend his city. Embrun was looted and ruined, and Greenskins responsible for that were far away – safe from the wrath of Bretonnians. And Duke Adam strived for revenge. He wanted to find guilty and punish them severely, and since Goblins were out of reach – Skaven were about get the blame. They were near and more or less vulnerable to attack. Skaven will perish and pay for all what’s happened here. Duke Adam didn’t care that Skaven had nothing to do with sacking Embrun. They were spawns of Chaos and they will be purged! …and Lord Quicksqueek bad luck continued. No gold, no Warpstone tokens, no glory – and annoying Bretonnian horse-man-things were on his back. He lost the favour of Horned Rat – there’s no doubt about that. 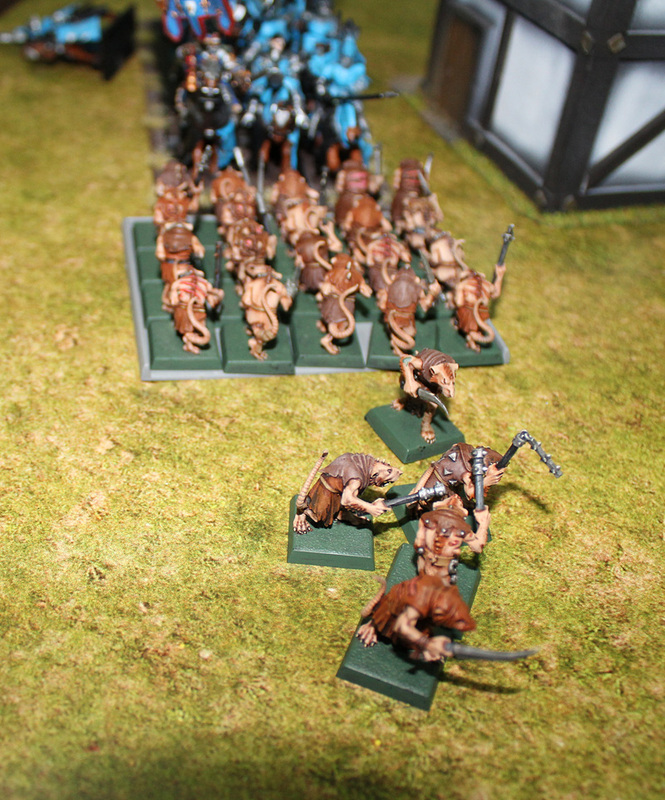 Skaven were caught by surprise by Bretonnians on the east of Embrun. Duke Adam came from west hoping to smash the rats at sight. Skaven army. 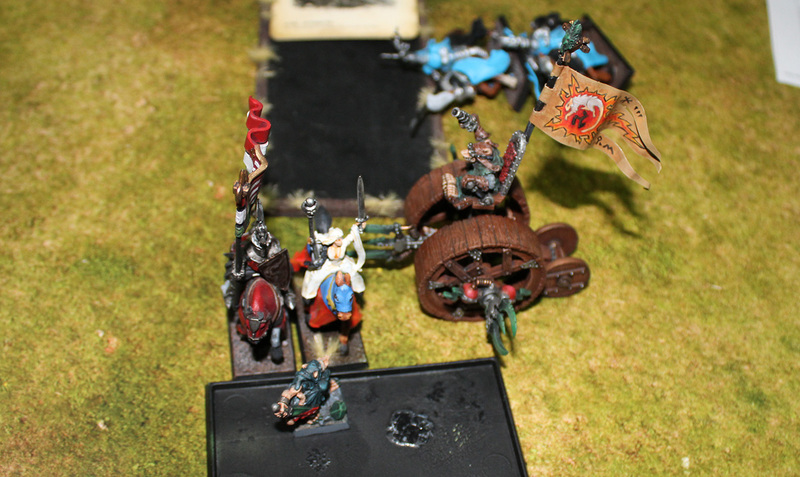 From below: Skaven Slaves, Clanrats led by Chieftain, Stormvermin with Grey Seer and battle Standard bearer, 2 Doomwheels. Most action took place in southern part of the battlefield near small Bretonnian settlement. Bretonnians started the battle with praying for the Blessing of The Lady. It took them some time to get 6+ ward save, so Skaven began. Doomwheels, advance! – Lord Quicksqueek did not have to give that order. Both crazy Clan Skryre Engineers pushed the accelerators and rolled forward. Roll-roll and bring death to man-things! Smash-smash! – shouted one of the engineers. He was so exited and so absorbed by the heat of the battle, so he forgot the second Doomwheel is near. He released the lightnings. Powerful electric charge struck another Skaven machine and destroyed it to small pieces. Oh, no! What a unpleasant and unfortunate surprise from the brother of Clan Skryre. So, only one Doomwheel left slowly rolled towards Bretonninas. Rest of the army waited at their positions for Bretonnins lances. They will come anytime soon. Lord Quicksqueek tried to cast two spells, but he got counterspelled by Prophetess with ease. First – Skitterleap was dispelled with the power of Silver Mirror. Lucky for Grey Seer, Talisman of Preservation protected him and he did not receive any wounds. The second spell – Howling Warpgale, which could affect Pegasus Knights, was also dispelled. Lord Quicksqueek growled with anger – it is not how it supposed to be. His magical powers are so powerful, and this little female man-thing dare to stand on his way! She will be smashed by Skaven soon! All three units of Knights marched forward. The Skaven will taste Bretonnian steel very soon. One unit moved around the settlement. 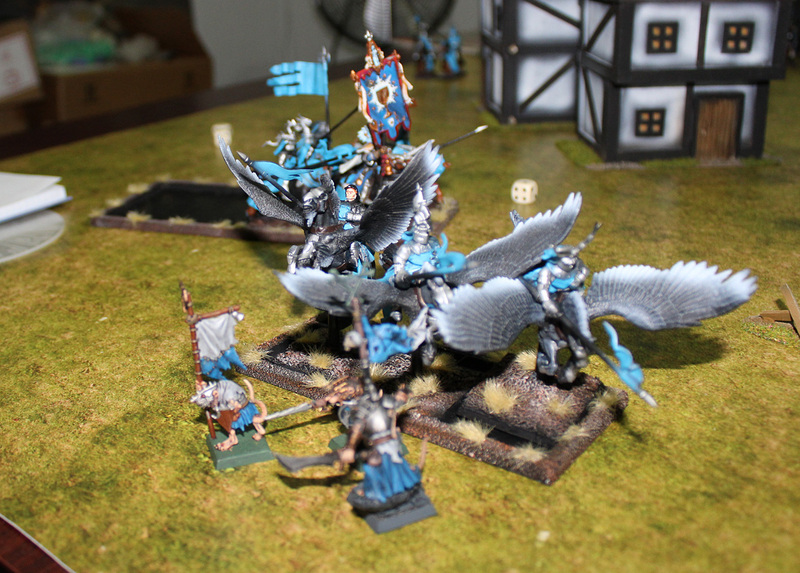 The other marched ahead and Pegasus unit flew over the houses and land in front of Clanrats. That was frontal assault! The Trebuchet crew cheered with triumph! Quite an achievement of these simple peasants. Even Knights were impressed with their accuracy. …and that was not over. Second Trebuchet targeted regiment of Clanrats. And it was also direct hit! 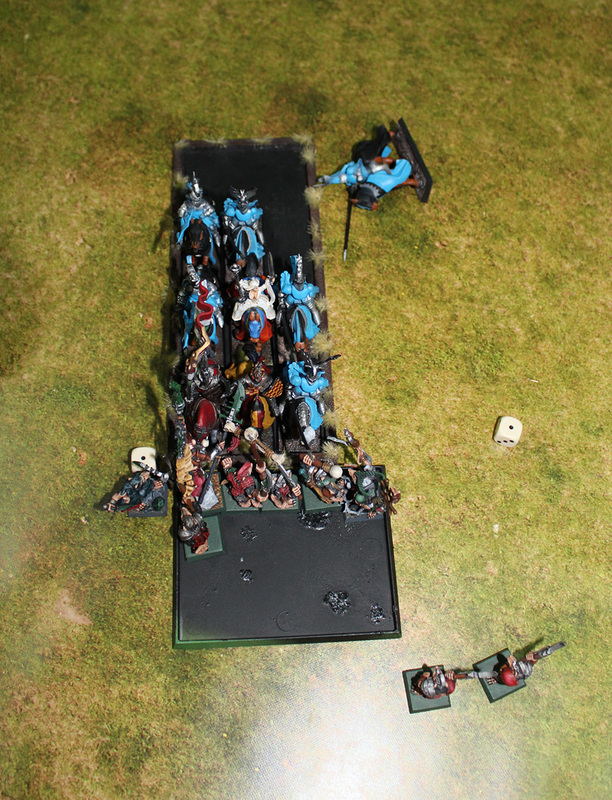 21 Skaven hit by the large stone blast – all died instantly. Terrible loses of Skaven did not shaken their morale. They stood fast ready to fight against Bretonnians. 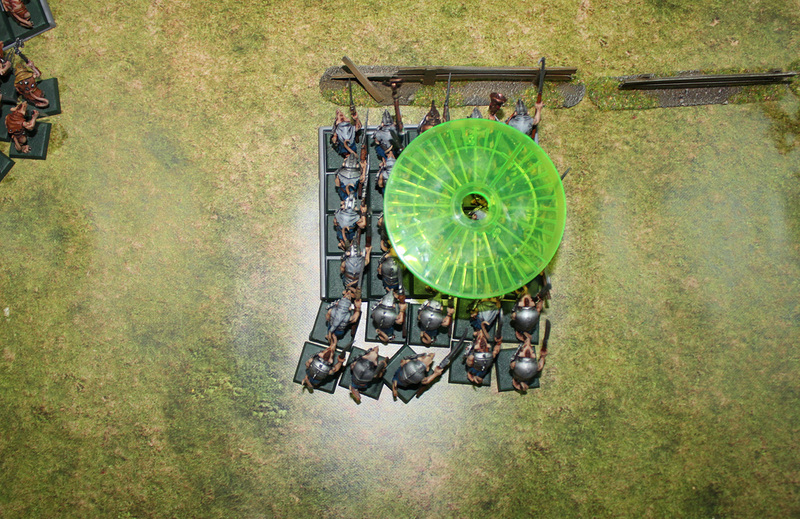 What an amazing skills by both Trebuchets crewmen – 41 Skaven killed. Absolutely brilliant! On the other hand – Lord Quicksqueek was far from being in cheerful mood. Clanrats hit! 21 fell dead under big rock thrown by Bretonnian Trebuchet. 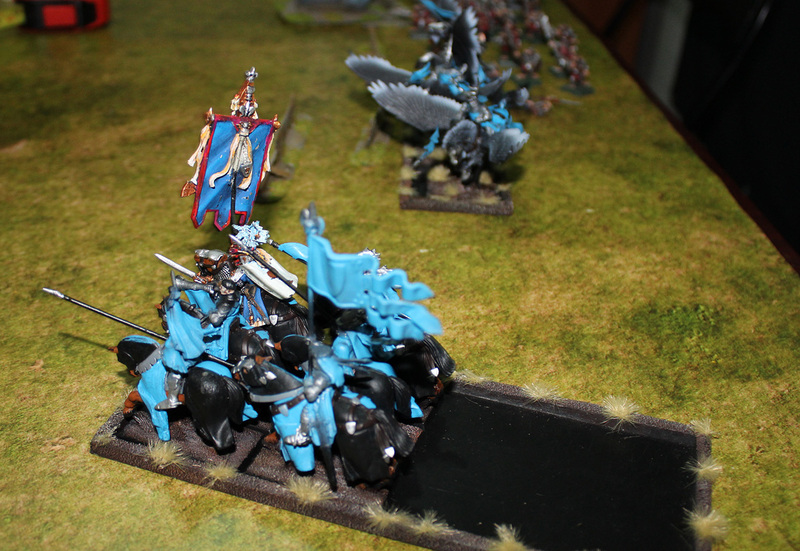 He decided he has nothing to loose – he ordered all Skaven to charge! After all, man-things are weaklings, and they will easily fell under the blades of mighty Skaven warriors. Doomwheel made a turn into direction of Bretonnian Knights, releasing three lightings on its way. All three hit northern Trebuchet and smashed it to pieces (REVENGE!). Any moment it will impact into closest unit of Knights. Meanwhile three units clashed in combat. Skaven Slaves vs Knights of The Realm. Clanrats were fighting Pegasuses and to be honest Slaves fought braver. 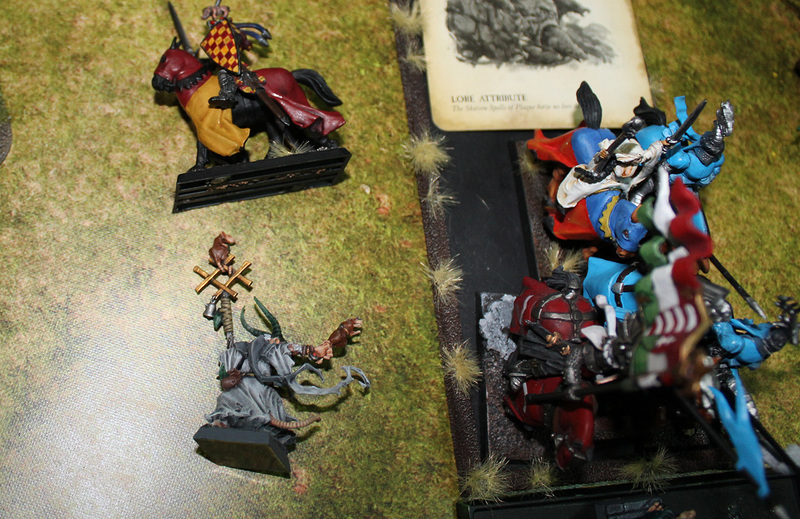 They wounded one Pegasus, but Knights killed two Skaven. The Clanrats regimental bell rang and Pegasuses horn was blown – both units remained in combat. Who has the courage to fight against Duke Adam de Embrun? Do you hear me, you vermin scum?! He did not predicted one thing – Shide The Silent, the emissary of Clan Eshin, cunning Assassin, jumped at his horse and struck him with his poisoned Weeping Blade. Shide laughed while the blade was penetrating the armour of The Paladin. Man-thing general was dead…but wait! The Lady of the Lake Blessing protected Duke, and his mortal wound sealed up. It was a miracle! Shide jumped off the horse to fight another Knights, and Duke Adam rode against Raddrish The Last, Skaven Battle Standard Bearer. 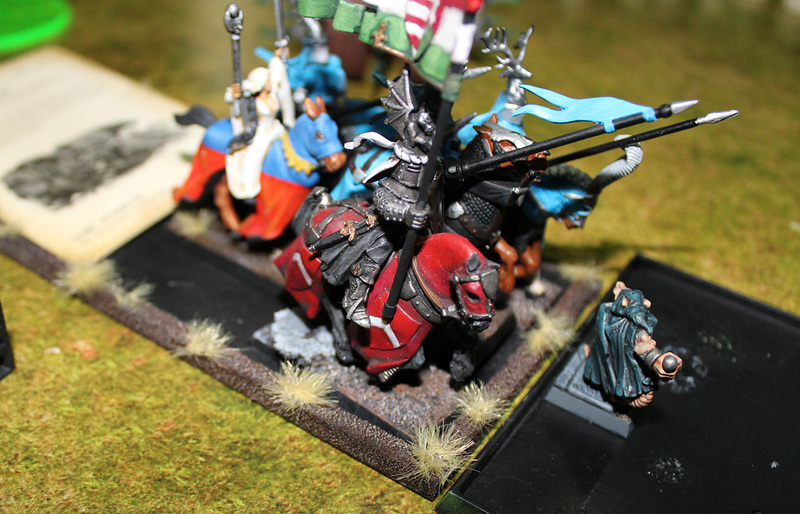 His lance scratched Skaven slightly, but he remained alive. Rest of The Knights clashed with impact with Stormvermin. They killed 3 Skaven, and only one Knight fell in response. Here, regimental musicians also inspired hearts of fighters with boost of bravery. They remained in their positions. Stormvermin vs Knights of The Realm. 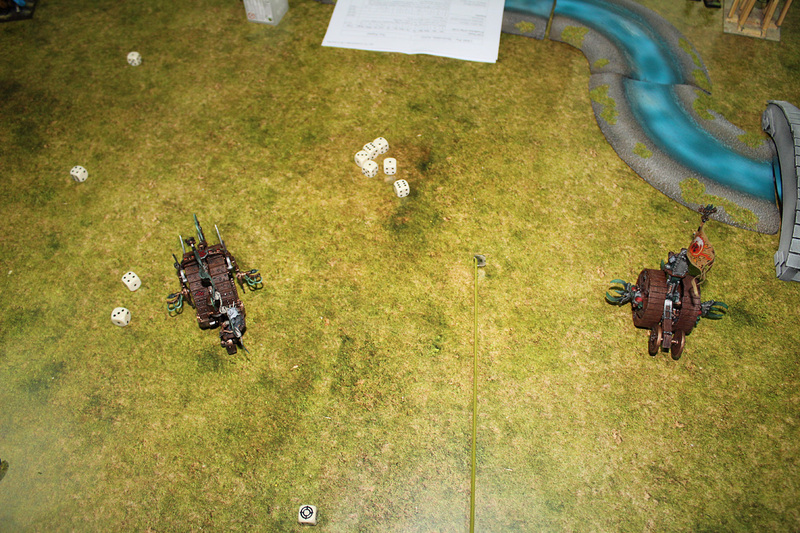 Trebuchet tried to hit Doomwheel, but the stone missed warmachine by miles. Prophetess managed to cast Regrowth spell on the unit of Pegasus Knights. The wounded Pegasus was back to his full health again. Slaves’ amount of luck drained out. Knights threw away their lances, took off their sharp swords and started true massacre – 5 Slaves were killed, but in return 1 Knight were bitten to death by some despaired Skaven. Slaves were not natural born warriors. They were sent to the battles by their masters to annoy enemies. Tied them for a moment in close combat, so elite units could do their job… but this unit of Slaves refused to flee. They held their ground, trying to resist their superior opponent. 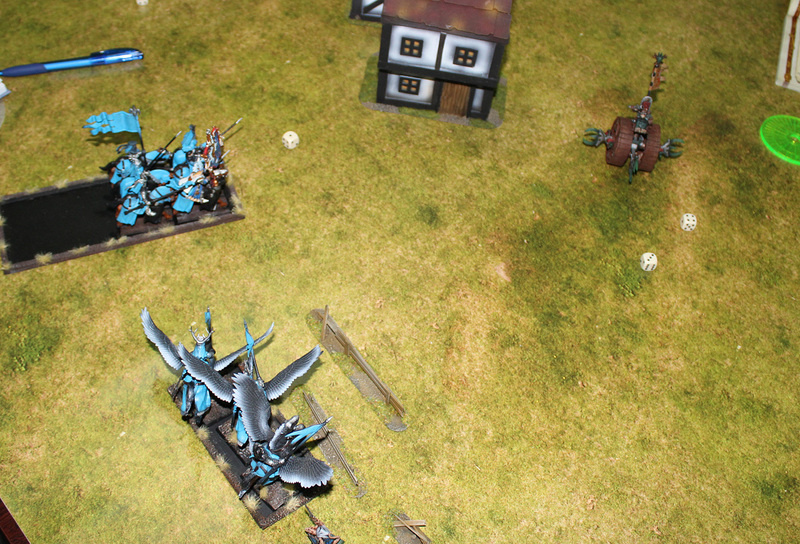 Skaven Chieftain Tax was leading his Clanrat unit and he was hoping they could get rid of these flying horse-things. He swung his sword and one Pegasus fell dead. Finally – triumph! Pegasuses were brave and they were not that easy to break. They stomped over two Clanrats and once again the sound of regimental musicians called for tie in this unresolved combat. Duke Adam and his Knights continued the fight vs Stormvermin. He cut the throat of Raddrish The Last and his Knights killed 2 Stormvermin. The numbers of Skaven were getting shorter. Even Lord Quicksqueek was wounded, despite his ward save from Amulet of Preservation. Skaven in return killed 2 Knights. Few remaining Stormvermin were starting to think about fleeing away, but Lord Quicksqueek simply roared: Fight-fight! You traitors! Hold the line! and the unit scared more of Grey Seer than Bretonnian blades stood fast. Skaven Battle Standard Bearer is dead! Warlock Engineer on the top of Doomwheel turned left. He wanted so badly to roll into flank of those hideous blue horse-man-things. He rode fast and steady and he almost impacted into the unit, but before that many things occurred. Like for example – released lightning hit into clashed units of Knights and Stormvermin – unfortunately zzaped to death last Stormvermin. The whole unit was annihilated by Clan Skryre ally! First, the other Doomwheel and now this! Traitor! First of all, Lord Quicksqueek finally took enough power to cast Wither on Knights of The Realm. Spell made man-thing weak as Lustrian Skinks. They will be easy to defeat right now. As for combat – Slaves continued to struggle with Knights, but this time Slaves were finally no match for Realm defenders – 5 of them got killed and they fled like they always do. Knights reformed and started the preparation to charge Clanrats from the left side. Pegasus Knights vs Clanrats. Here, combat was the most cruel. Tax wounded slightly one of two remaining Pegasuses and they killed one Clanrat. Music echoed – Skaven bell and Bretonnian horn. Both sides hold their line. Really, this was amazing – how humans and Skaven were tied in combat for so long. Pegasus Knights vs Clanrats. Tied combat situation. As Stormvermin were no more, Grey Seer had no bodyguards of his. And guess what, he got killed by the Bretonnian swords. Even Talisman of Preservation did not help him this time. Shide The Silent though had his moment finally – he cut right trough the plate armour with his Weeping Blade covered with corrosive and deadly poison. The blade reached the heart and Duke Adam fell of his horse with no sign of life. Lady of The Lake abandoned him. Clan Eshin eventually prevailed as always. Both generals were dead, but the battle was still on. 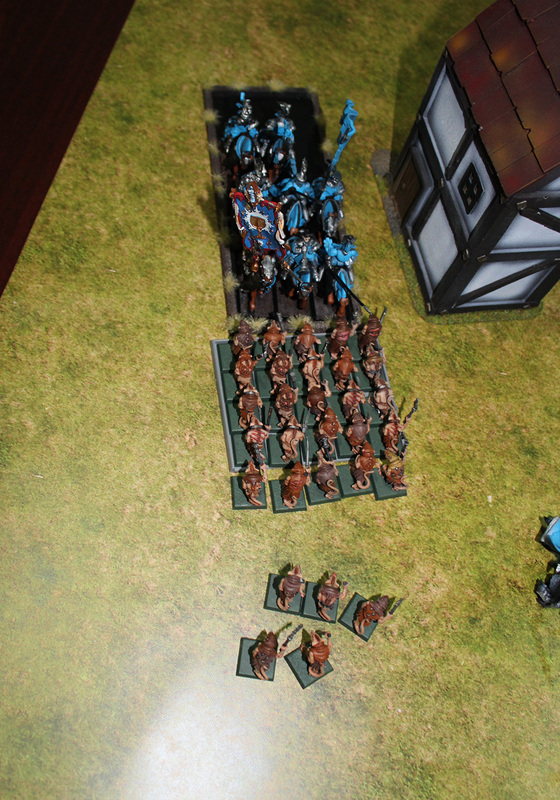 On the left flank, where Skaven Slaves were no more making some commotion, Knight were finally able to charge Clanrats. 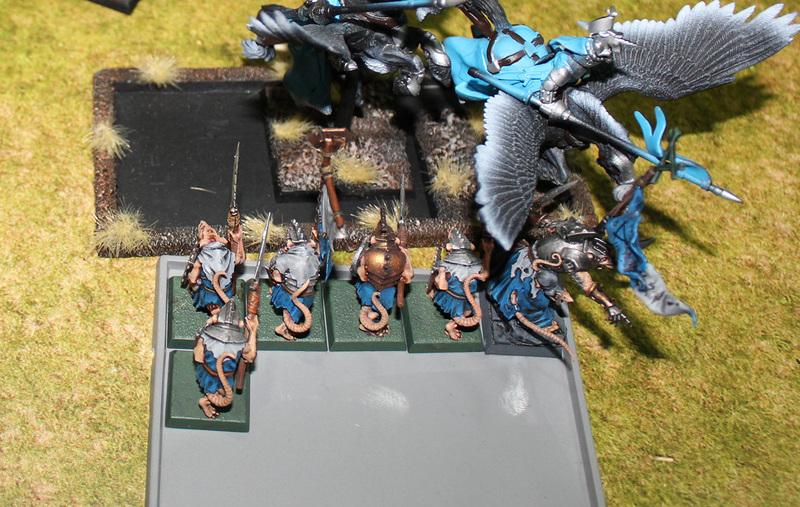 Surrounded, abandoned by their general – Clanrats regiment almost entirely wiped out by Trebuchet stone and Pegasus Knights were easy vulnerable target for Knights of The Realm. All of them except one were killed during Knights’ charge and Tax, Skaven Chieftain and regimental standard were last of his regiment. Almost all of his Clan brothers were dead, so he saw no other option. 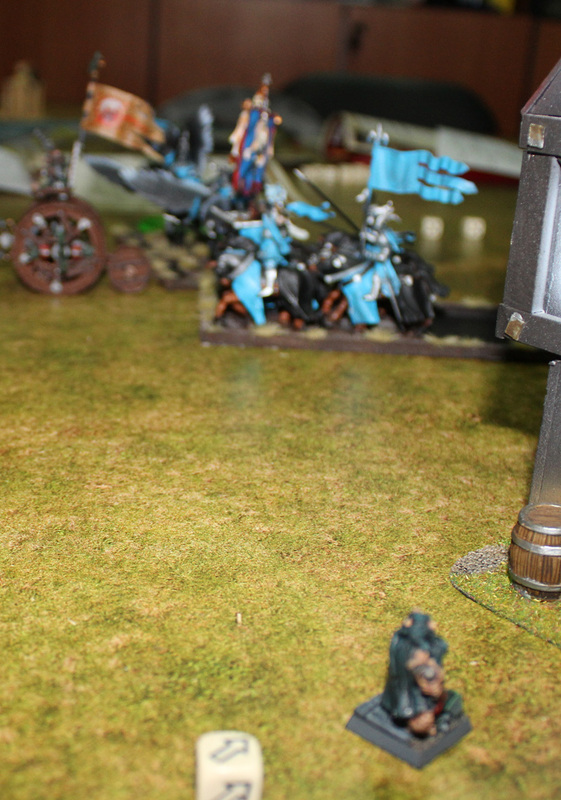 He simply did what every honourable Skaven Chieftain would do – ran as fast as he could. Unfortunately Pegasuses were fast. They caught him instantly and finished him off. And a moment before that, Prophetess casted Regrowth on Pegasuses, so the regiment was fresh and new. All wounds got healed and one dead Pegasus Knight was brought back from the dead. Thanks The Lady. Meanwhile, Shide – Skaven Assassin were striving to survive here. He was wounded by Bretonnian Knight, but he managed to kill one of man-things. Combat remained unresolved, but Skaven definitely were loosing this battle. Their last hope was Doomwheel. Finally! Doomwheel rolled into combat! 2 Knights were grounded by the wheel. Doomwheel charged from the right. And since there was nobody to fight back rats and the driver – all attack were directed to The Prophetess, to this moment hidden in second rank of Lance Formation. Now, all The Knights were dead (only Gallant was alive) and she was forced to face enemies. Even Assassin pointed his blade at her direction. Lucky for her, she had Talisman of Preservation like Lord Quicksqueek had (or something similar – after all, there no two Talismans like that, right? ;), and all attacks from Assassin, rats and The Driver were saved with its magical aura. 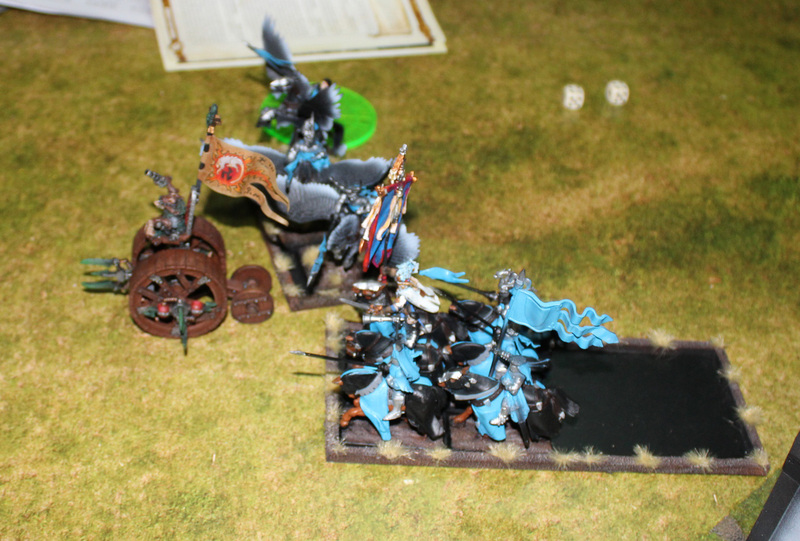 However, the charge of The Doomwheel from the right side was too much for Prophetess and brave Gallant. They fled. They rode their horses as fast as possible, but even Shide The Silent was faster – he stabbed defenceless Prophetess at he back, and strangled Gallant with his long tail. Easy kills. The sun was low. Battle slowly was ending, but Knights were hoping to eliminate Skaven threat, so all surrounding settlements would be no bothered by vermin in any way. 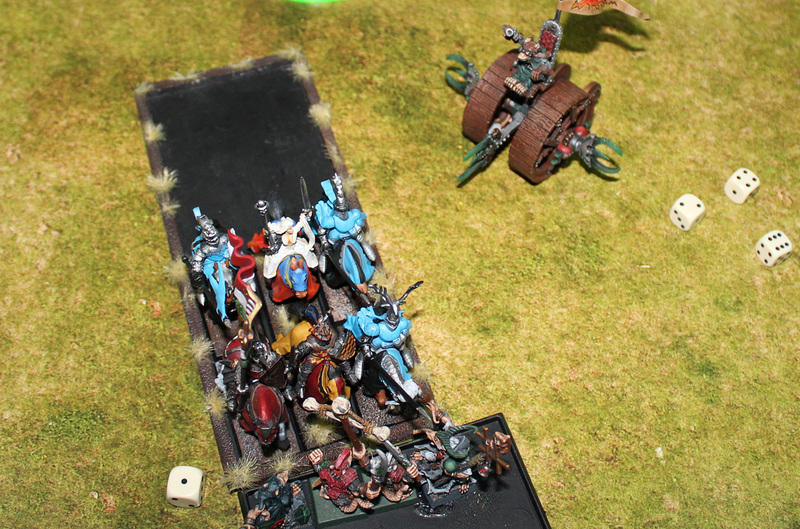 Knights of The Realm and Pegasuses turn their faces in direction of Skaven Assassin and Doomwheel. The Knights were after all Skaven. Meanwhile Trebuchet, tried to hit Doomwheel but the rock fell far away from the target. Doomwheel turned around and moved near to Bretonnian Knights. The plan was to tied them with combat – right before the end of the day and burn them with electricity of course! Unfortunately power generator malfunctioned and small discharge caused temporary power drain. There were no lightings right now. Shide The Silent moved to hide behind the house. Last Skaven were anticipating the next move of The Bretonnians. Doomwheel charged by Bretonnian Knights. The impact of Knightly lances was massive. The wooden construction got weakened in many places, but the whole machine remained intact. 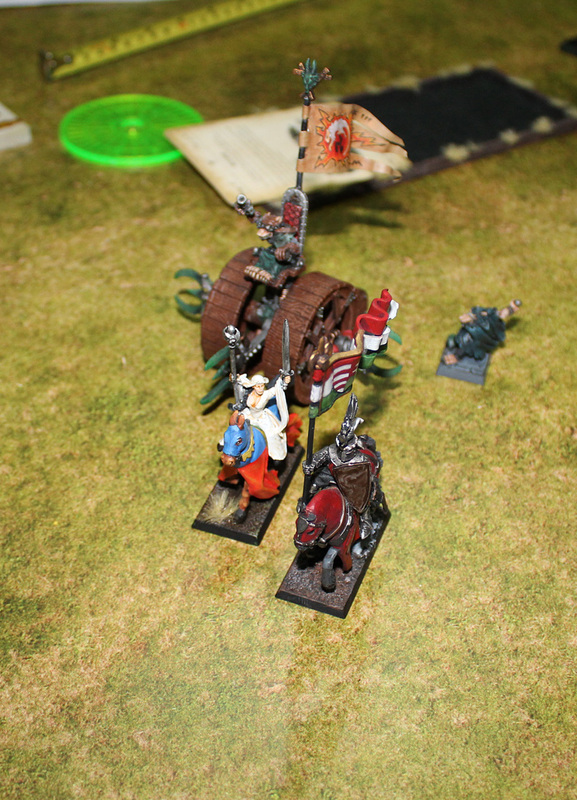 Skaven Engineer though become little bit concerned about his wheel, so he decided to turn it away and withdraw. Knights of The Realm and Pegususes pursued, but they were too slow and Doomwheel was save to roll away. Trebuchet aimed and Skaven Assassin, but apparently after early battle success with elimination of 41 Skaven, Bretonnian crewmen lost their accuracy. The stone landed far away from Assassin. Doomwheel was meant to stay save – Engineer directed the steer off the the battlefield and pushed the acceleration lever. The machine was fleeing away – to find safer place than this. Shide just watched this from his hideout. The time was to withdraw too – Clan Eshin has different methods to eliminate their enemies, not necessary battles. Especially lost ones. He stepped into shadows and disappeared. Assassin watched fleeing Doomwheel and decided to withdraw as well. The battle was over. 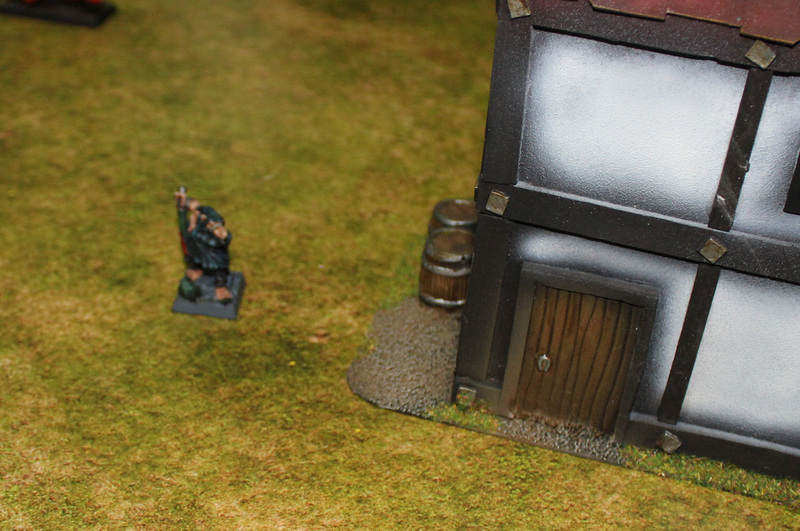 Shide withdrawn to the nearest Skaven tunnel entrance. Doomwheel eventually was caught and destroyed by Bretonnians. Whole Grey Seer Quicksqueek force were disbanded. And Quicksqueek himself was dead. His story was over. Or is he not? Is there more of his story? What will happen next? All will revealed in next episode – the epilogue. Stay tuned. Amazing game. I lost again, but I loved it. I was so unlucky with my rolls and my opponent quite opposite. The epic save of three wounds by 6+ wound save or my three missed Assassin to hit rolls (three 1s) summaries all. Well, I’m kind of used to this – some day my rolls will improve- hopefully. Matter of attitude, I guess. well, two direct hits from Trebuchets into my units of Clanrats and Stormvermin killing over 40 Skaven in one phase in first turn. Early gamechanger – there were nothing I could do. From that point I knew – the game will not be easy for me. Spells seems to be super important for Skaven – if you don’t have right spells to cast, your army loose major advantage. And I couldn’t cast Curse of The Horned Rat on cavalry. Damn. Stupid Bretonnians;). It should be the last battle in the story line of Lord Quicksqueek. I planned to end it right now, but one more battle (against Dwarfs) popped off. So there will be epilogue – this Saturday…but generally I’m planning to rearrange my Skaven army and start new story. This time I concentrate on Clan Pestilens. I’ll bring plague and rot on all Old World! It will be definitely something different from Grey Seer’s battles. 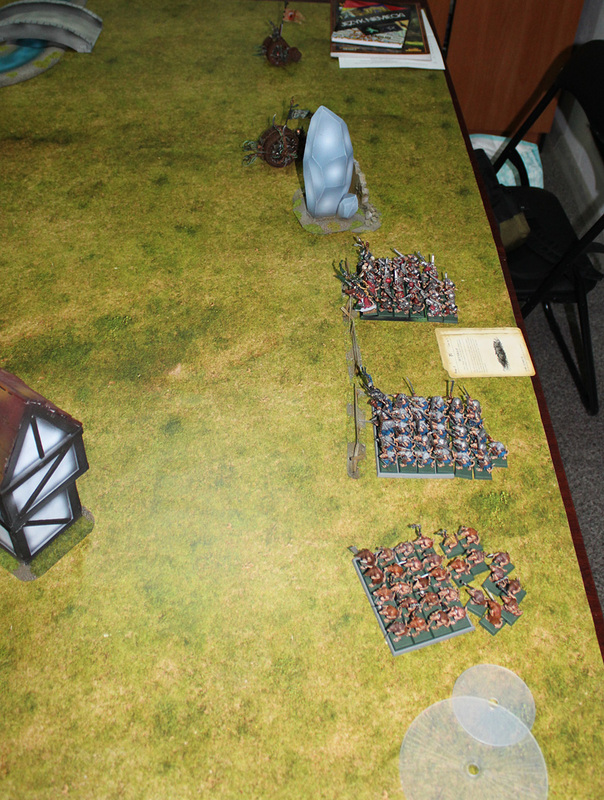 And today another battle – my favourite edition of all – 5th – Skaven vs The Empire. This will be follow up battle of this mini campaign. We will introduce some our home-made rules to make the game more interesting. 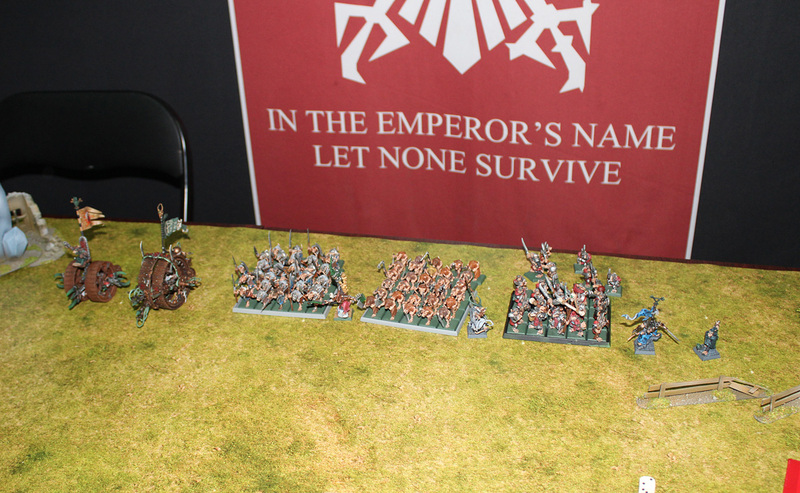 Expect battle reports soon – both form Dwarfs and Empire battles. Awesome read – how unlucky with those trebuchet shots! Great report. It sounds like maybe you just had luck in the wrong places. After all, those Slaves did a remarkable job holding up in combat against the Knights. But losing so many Skaven in turn 1 to the Trebuchets was really horrible. Yes, too bad about those trebuchet shots. I guess it is back to the slave pits until next time!